Equine Max™ with Flax - Hudson Livestock Supplements Inc.Hudson Livestock Supplements Inc. The Equine Max™ with Flax Tub is formulated to meet the needs of all classes of horses and is available in three popular sizes. For horses in pasture situations the 125 pound or 225 pound sizes work well. The 50 pound bucket is an excellent choice for horses in stalls and is easy to carry along in your horse trailer to shows and other special events. 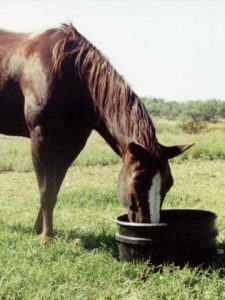 As long as the Equine Max™ with Flax is available to your horse with hay and salt, or pasture and salt, the convenience of feeding on a daily basis is guaranteed. The hassle of mixing different vitamins and minerals to granulated feed is not a problem anymore, because the Equine Max™ with Flax furnishes the daily requirements of vitamins and minerals.